To me the Baikal is in the same league as a 1940s prefab or a 1950s Ford Popular. The prefab gave ordinary folks a taste of living in a dry, well-designed, warm house with an indoor toilet, a bathroom and a fridge, while the dear old Popular, with its crude side-valve engine and cart-spring suspension, gave working folks a taste for the style of motoring they had thought they might never afford. Likewise, the Baikal gave lots of ordinary guys a chance to buy a new gun, which, although not high on the elegancy stakes, was – and still is – strong and long-lived. 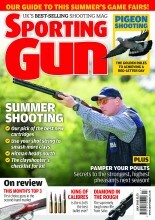 So let’s have a look at Russia’s contribution to the British shooting scene. Craftsmen in the Russian city of Izhevsk have been making guns for well over 200 years, beginning with smooth-bore muzzle loaders in the very early 1800s. They have a long history of providing small arms for their country’s armies, and during World War II they turned out thousands of rifles for troops repelling Hitler’s invaders. This is really where our story begins, for in 1942 a major arms factory was set up in the city. In the dull nomenclature of Joseph Stalin’s regime, it was called Plant 622 – now known as the Baikal factory. The factory has always made military arms, and continues to do so in modern times. Famous guns include the Makarov pistol, which was really a crib of the German Walther PP, and the AK series of assault rifles, which was the product of home-grown genius. It is claimed that the factory has made up to 95 per cent of Russian small arms, and during the Cold War its importance was such that it was designated a closed city where foreigners were not allowed to visit. In World War II there was good reason for the factory’s rapid development. Izhevsk is more than 750 miles east of Moscow, which was well beyond the reach of Hitler’s Luftwaffe, and was theoretically capable of still producing arms even if Moscow had fallen. But that’s all in the past now, as is the decision, in 1960, to start making Sporting guns. The gun featuring in this article is the result of a relatively short-lived venture between Baikal and Remington, who wanted a cheap, break-action over-and-under. They called it the Remington Spartan, but it was a Baikal through and through. It was also quite elegant when compared to some of the guns I first encountered in the early 1980s. In that era the guns were often quite roughly machined. Actions were a dismal black, and the blacking on the barrels often had a greyish tint. All were fixed chokes, and the stocks were rather short, certainly not walnut, and treated with a reddish stain. Back then, Baikals were imported by Sportsmarketing of Colchester; it also brought in Baikal cartridges for a time. That situation ceased when the Soviet Union collapsed, and quality dropped alarmingly. It was rumoured that workers had not been paid for several weeks. After a time, however, things returned to normal, and new Baikals are now mainly available through York Guns, and the Sportsman Gun Centre’s shops in Exeter and other centres in the west of England and Wales. The range is considerable, and includes O/U and side-by-side shotguns, air rifles and pistols, and centre-fire rifles in a variety of calibres. Baikal shotguns have come a long way since the 1970s, and presentation is now hugely improved, but in the value-for-money stakes they face a challenge from Turkish gunmakers. Nevertheless, the Baikals are well-worthy of examination if you are looking for a basic, reliable tool without any pretensions of grandeur. Finally, Baikals are not typical of all Russian-made guns. I was lucky enough to visit Moscow in the Soviet Union’s Mikhail Gorbachev era, and I was shown some side-by-sides made in Tula, Russia’s other major gunmaking city. They weren’t quite up to “London Best” quality, but not far off, and nothing like a Baikal.